California is the largest residential solar market in the U.S. by a wide margin, so provides a good proxy for the residential solar market share by installer. 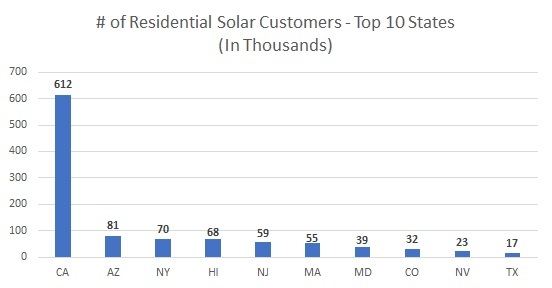 As of October 2016, California has over 600,000 residential solar customers, which is 7.5x more than the second largest solar state (Arizona) and more than the 9 other states in the top 10 (445,000). 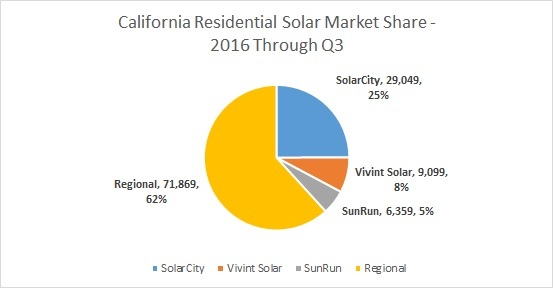 In 2016 (through Q3), the national installers had 38% residential solar market share in California with SolarCity at 25%, Vivint at 8% and SunRun at 5%. The remaining ~60% of the market consisted of regional installers. As noted in our October update, “National Solar Installer Market Share Declining in California“, regional installers have been increasing their market share in part because of a pull-back in marketing and sales spend by the national installers. To stay up to date on residential solar market activity, subscribe to our Weekly Solar Index.